The post will describe the steps I have taken so my Netgear R7000 router running DD-WRT firmware to dynamically update a DNS record on AWS Route53 on WAN IP changes. I run a home VPN server to remotely connect to my home network and route my mobile phone traffic through. My ISP uses a dynamic IP address and I suffer frequent disconnects even though speed is good. This means daily IP changes if not more! Using a static hostname i.e vpn.example.com and having the router automatically update Route53 with new IP addresses means I can consistently connect to my home VPN using a single host name without having to worry about IP changes. DD-WRT comes with built in support for DynDNS and other services however I use AWS and which to use a vanity host name. For this example we will assume our DNS hostname is example.com and we wish to have vpn.example.com dynamically updated to point to the routers external wan IP. In Route53 the hosted zone we will assume example.com already exists. For vpn.example.com rather than add a new record set to the exiting hosted zone we will create a new hosted zone for vpn.example.com. 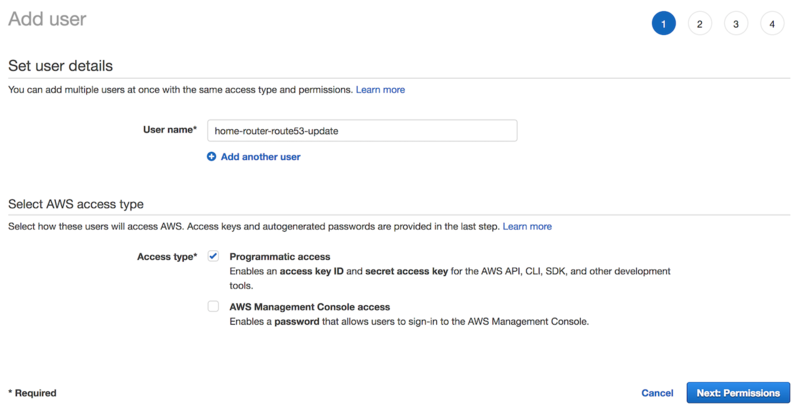 The reason behind this is AWS IAM does not allow fine grained controls on updating specific records in a hosted zone and we want a limited AWS user account to use from the router that only has permission to update the DNS entry for vpn.example.com and no other AWS permissions. After creating the vpn.example.com hosted zone add a new NS record set copying the values of the NS record from the root example.com zone. Note: AWS charges per hosted zone so we will be charged for two hosted zones above for the extra security. In the AWS console go to the IAM section, then click `Users`. Click JSON then paste in the below, change MYZONEID with the zone id for vpn.example.com displayed in Route53 created previously. Click Review policy, on the next screen give it a Name AllowUpdateDns then click Create policy. Go back to the previous add user window, click the Refresh button next to Create Policy then in the search box type AllowUpdateDNS, select it and click Next: Review. On the next page click Create User. On the next page copy the Access key ID value and Secret access key value. Keep these secure and do not loose them, these are the credentials used on the router to make Route53 API calls for updating the DNS. This is the most complex part. DD-WRT has a restricted set of applications installed, aws-cli or alternatives are not available on the router so we need to write a statically compiled binary that will run on the ARM cpu that will communicate with Route53 to update the DNS on wan ip changes. For this we will use Go as the Go AWS SDK has better documentation than their C++ SDK and Go supports ARM static binary compilation. This is not advocating Go! I was unable to get go cross-compilation working from OSX as am a mac desktop user so I used scaleway.com for a cloud based ARM server to build the binary. If you have a RasberryPi or other ARM based server available, or know about Go and cross compilation you can skip Scaleway, if not go and sign-up, create a C1 server instance with Ubuntu Xenial which was Scaleway’s latest Ubuntu distribution as of writing this. Once the server is created SSH on to it. Next install Go 1.10. Xenial has Go 1.6 by default and we need Go 1.10 so we can use the SSL_CERT_FILE parameter further on, Go 1.6 has a hard coded list of ssl cert locations for some obscure reason and they will not work for us. Once it’s built, download the route53-update binary file using scp and copy it to /jffs/bin. Note: if you run the file cmd on the binary you should see the below output. It needs to be statically linked and I also noticed it needed the debug info stripped to work. If you do not see the below verify your Go build parameters. JFFS2 is the routers internal flash storage. Any data that needs to persist though router restarts should be placed in the JFFS2 enabled flash storage. To enable JFFS2 click the Administration tab in the web gui, then Management if it is not already selected. The route53-update application talks to the AWS API’s using SSL. DD-WRT does not look to have a valid certificate chain file anywhere so the script will fail with an SSL error. Next go to https://curl.haxx.se/docs/caextract.html, download the cacert.pem file and copy it to the /jffs/ssl/certs folder using scp as we did in the previous step. DD-WRT on startup will look in the /jffs/etc/config directory if present and will execute all *.wanup scripts when the wan interface comes up, i.e when we get an internet connection / new ip. You can also add *.startup scripts to this folder which get executed when the router starts up. Ref. Script Execution. Create the below file at /jffs/etc/config/updatedns.wanup. Update the AWS_ACCESS_KEY_ID, AWS_SECRET_ACCESS_KEY, DOMAIN_NAME and ZONE_ID values to match what you have.